Aimee Dunn, played competitive soccer for 19+ plus including several national titles as a youth and adult. Always a runner she turned to adventure racing in her mid twenties. As a self proclaimed jack of all trades who bores easily this sport was a great fit for Aimee. She competed in the 2006 Primal Quest fulfilling a long time dream. Following this Aimee lept into freeride and downhill mountain biking on the North Shore which she found extremely challenging and greatly improved her riding skills. She competed in Psychosis after a year of this style of riding (not knowing at the time it is considered one of the most difficult courses in the world?). Another race resulted in a badly broken leg in 2009 months before her wedding. 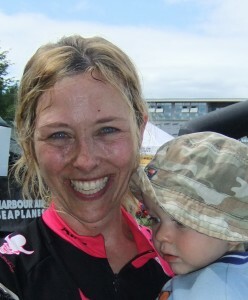 Shortly after she welcomed her first child and tackled the BC Bike Race (BCBR) which was a new competitive adventure for her. Aimee will be speaking about her evolution in sport and how being a parent changes one’s perspective… Aimee will include some highlights of her training and racing the BCBR.